Type II diabetes affects over 29 million people in the United States, yet the hindered insulin secretion pathway is not clearly understood. Now, recent research in the laboratories of Karin Reinisch and Pietro De Camilli at Yale University have provided insight into this biochemical mechanism. Insulin secretion occurs in two phases and is regulated by oscillations in the concentration of calcium ions inside the cell. 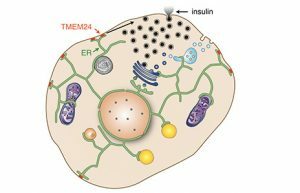 A lipid transport protein, TMEM24, is a key player in the mechanism of insulin secretion. TMEM24 is an endoplasmic reticulum (ER) protein that is concentrated at contact sites between the ER and the plasma membrane. Its binding to the plasma membrane is regulated by the concentration of calcium ions in the cytosol. An increase in calcium ions results in activation of the TMEM24 protein, causing it to depart from the plasma membrane. When concentrations of calcium decrease, the protein is de-activated, resulting in binding to the membrane. This lipid transport protein binds to a lipid called phosphatidylinositol (PI), the precursor to another lipid. TMEM24 transports PI from the ER to the plasma membrane for conversion to this other lipid form. This second form is essential in regulating concentrations of calcium in the cell, which in turn regulates the TMEM24 protein and regulates insulin secretion. Without TMEM24, the concentration of calcium ions does not fluctuate, causing insulin release to be impaired. Understanding this pathway and how it is impaired in patients with type II diabetes is fundamental to further research in the condition. The research team is excited to expand on this frontier of medical research.